Welcome to Mosaic Unitarian Universalist Congregation in Deltona, Florida, where we transform lives through compassion, service, generosity, and respectful relationships. We are proud to be an independent voice for progressive religious thought in Central Florida, yet we frequently partner with conservative religious groups to pursue our shared goals in social justice issues. We contribute financially to the support of the Neighborhood Center in Deland, and we donate food, clothing, and school supplies to those in need at Orange City Elementary School. We are also a welcoming congregation. Everyone is welcome here, regardless of who you love, what you believe, what faith traditions have marked your personal spiritual pathways, and how you perceive your place in the universe. Want just a quick look at what’s coming this Sunday? Click here! 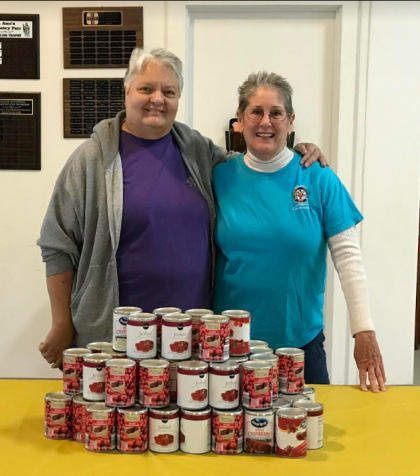 Ruth Dyer and Judy Raymond, both of Mosaic, help to distribute food to disadvantaged people before Thanksgiving. Each Unitarian Universalist congregation, and there are more than one thousand such groups around the world, is independent, and we use that independence to support our spiritual values. Mosaic, like other Unitarian Universalist groups, has no creed members are required to embrace in order to belong. However, we do have seven principles that we hold dear, and these principles guide our behaviors both as individuals and as a congregation. To review those principles, click here.